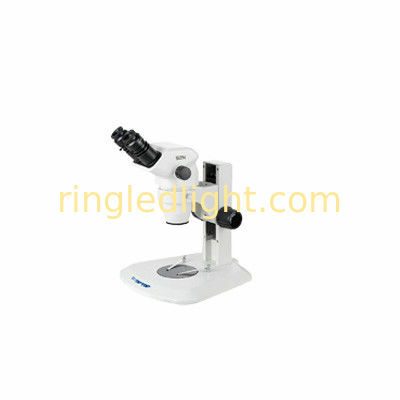 zoom stereo microscopes meet high-precision requirements on modern biology, medicine, scientific research, inspection lines in modern electronics and other technology industries. Viewing Head STM-BN-SZN745:Binocular head, 45° inclined, 360°rotatable, zoom objective 0.67X-4.5X, working distance 100mm. inter-pupillary range 54~76mm, both two tube diopter adjustment(±5), built-in interlocking device, fixed eyepiece tube. STM-TN-SZN745TR:Trinocular head, 45° inclined, 360°rotatable, zoom objective 0.67X-4.5X, working distance 100mm. inter-pupillary range 54~76mm, both two tube diopter adjustment(±5), built-in interlocking device, fixed eyepiece tube. STM-BN-SZN760:Binocular head, 60° inclined, 360°rotatable, zoom objective 0.67X-4.5X, working distance 100mm. inter-pupillary range 54~76mm, both two tube diopter adjustment(±5), built-in interlocking device, fixed eyepiece tube. Focus ST70A1 focus arm, two focusing knobs are with tension adjustable, adjust range 50mm. The zoom hand wheel (axial) bilateral settings, easy operation, high precision zoom repeat.